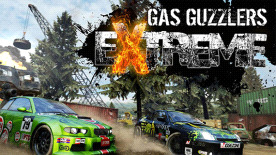 Gas Guzzlers Extreme © 2013 Gamepires. Developed by Gamepires. Licensed exclusively worldwide to and published by Iceberg Interactive B.V. All brands, product names, and logos are trademarks or registered trademarks of their respective owners. All rights reserved. Made in Europe.